Commute to Dwarka from Vasant Kunj, Dhaula Kuan and Gurgaon will become smoother as the Delhi government has proposed two underpasses and a flyover on National Highway 8. The Airports Authority of India (AAI) has, however, raised an objection over the height of the flyover as it is close to runway 29, one of the three runways at Delhi airport. The first underpass will start from Vasant Kunj Sector C and connect the Urban Extension Road 2, passing under the Delhi-Gurgaon Expressway which runs parallel to the airport’s boundary wall and connects to Dwarka. This will be 3.2 km long. The underpass will help commuters avoid taking the congested Mahipalpur road to go to Dwarka. “We have proposed two bypasses southern access and northern access from Vasant Kunj. Under northern access, we are giving signal free access to the airport from Vasant Kunj with the help of two flyovers and one underpass. Under the southern bypass, commuters going to Gurgaon and Dwarka will be benefited,” said a PWD official. The Public Works Department (PWD) had conducted the feasibility study of the project and has handed it over to National Highways Authority of India (NHAI). Once the NHAI’s work is done and the project gets no-objection from all agencies concerned, it will be handed back to PWD for execution. 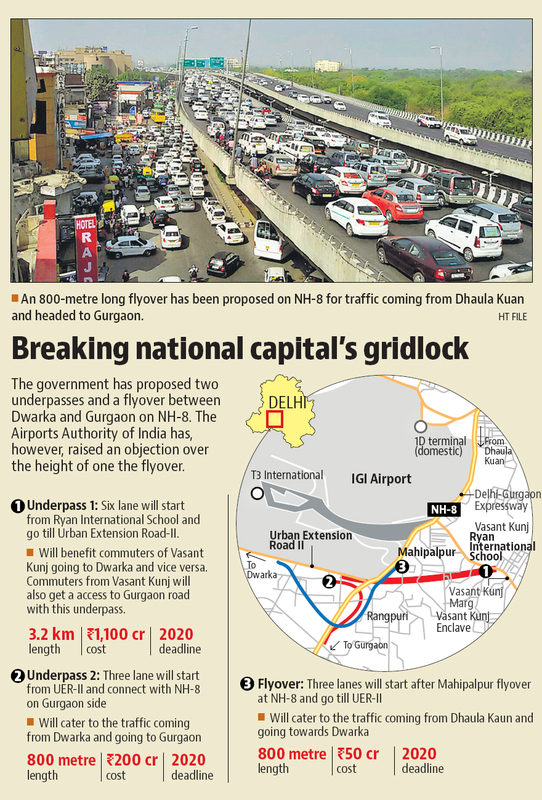 An 800-metre long flyover is also proposed on NH-8 for the traffic coming from Dhaula Kuan and headed to Gurgaon. “Giving right turn at the expressway would have hampered the traffic movement, a flyover was proposed so that traffic can turn right and go straight to Dwarka road, without affecting the vehicle flow on the expressway. The flyover will start soon after the Mahipalpur flyover,” the official said. However, AAI has suggested some changes as flyover is close to the runway and the point where planes descend onto the runway. The second underpass, which would be 800 meters long, will help commuters coming from Dwarka and headed to Gurgaon. Currently, they have to go towards Delhi and take a U-turn. “This underpass will start from UER-II and will pass under the expressway and then merge with the NH-8 towards Gurgaon. So, the traffic from Dwarka to Vasant Kunj can take the first underpass and those wanting to go to Gurgaon can take the second underpass. While the first underpass will cater to traffic from both sides, the other two projects are for one-way traffic,” the official said. After necessary approvals, the proposal will be placed before the Unified Traffic and Transportation Infrastructure (Planning & Engineering) Centre (UTTIPEC) before construction could start. The project will require at least 2-3 years to be made. The Delhi government has also finalized the proposal of an underpass between Vasant Kunj and the airport. The Airports Authority of India (AAI) has given its go-ahead for the project, which the Public Works Department (PWD) hopes to complete before the end of 2019. Apart from an underpass at National Highway 8, a flyover at the Vasant Kunj side and a flyover at the airport side has also been proposed, which will also cut travel time by 30 minutes.